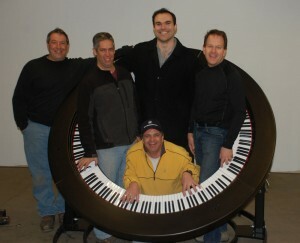 The following people and companies have contributed to the PianoArc revolution. We are proud to call them our extended “family”. Richard Fell took the initial concept as presented by Chuck and Brockett and made it into physical reality for early PianoArc units. Rich pursued the idea and it’s implications with a passion and enthusiasm that he brings to all his work. He innovated a hybrid action that allows for the curvature while remaining adjustable and durable. 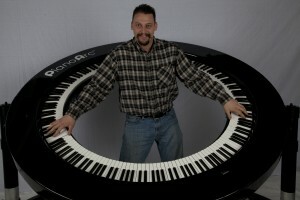 As the founder of PianoServicePro.com he is a leading regional piano rebuilder and concert technician. Chris, working with Jim got the ‘big picture’ rolling with this project. They developed ideas from the Circle Piano theme that keep some of us awake at night. Chris also contributed build hours – and gets the long distance award – traveling from Providence to Woburn on multiple occasions to help put it together. Tony is a super-capable and creative metal worker. He built the folding stand and support mechanism for our second full circle. As head of Bradford Welding, Jim Allen and his team fabricated the stand and supporting hardware with speed, precision and economy. Try to find that somewhere else! His can-do attitude helped a tricky part of the project take flight. It was Kareem who threw the original idea out in a conversation with Brockett in the waning days of the last tour. Musicianship and all-round creativity go hand-in hand – and Kareem is the ultimate proof. Thanks Kareem! You can find Kareem at his facebook page. Jay Gallant’s fabulous graphics firm Wicked Stickey Designs www.wickedstickey.com contributed the logos for the PianoArc.